Through Willamette's undergraduate programs, stellar professors create learning experiences in and out of the classroom to help students translate knowledge into action. As the only law school in the country associated with one of the Colleges That Change Lives, Willamette College of Law offers a unique environment for pursuing a JD, LLM or Master of Legal Studies (MLS) degree. 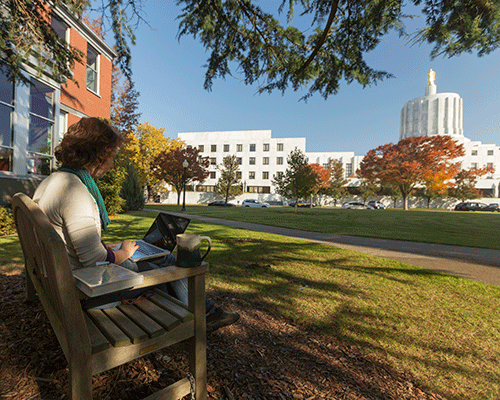 As the first program in the world to hold dual accreditation by the AACSB International (for business) and the Network of Schools of Public Policy, Affairs and Administration (for public management), the Willamette MBA prepares graduates for careers in business, government and not-for-profit management. Willamette University is home to three schools — the College of Liberal Arts, College of Law and Atkinson Graduate School of Management. Known for their distinctive learning environments, rich curriculum and outstanding faculty, these schools equip students with practical and professional skills that have lifelong value. Students are also able to combine their undergraduate and graduate experiences through our unique dual degree programs.